Below are a few terms and other resources to help anyone that reads this blog. Don't take any of this too seriously, you may not make it out alive. Autoimmune disease that affects the insulin producing portion of one's pancreas. Basically, meaning the body can't handle the food you eat. The body is unable to process carbohydrates (if you don't know what a carbohydrate is then please stop here and check out webster dictionary). Otherwise known as The Betes, Sugar Betes, Beetus, Pancreatically Challenged, Unemployeed Pancreas. Type-1 diabetes (or insulin dependent diabetes) is when the body does not produce any insulin. Type-2 diabetes is when the body produces insulin but is less efficient at moving sugar out of the bloodstream. Type-1 is always treated with insulin, while Type-2 is typically treated with diet, exercise and other medications and some times insulin. Long story, short; they are very different. Roughly 21 million people with diabetes, only 5-10% have type-1. A person without diabetes that "gets it", supporting and love the betes. When the betes strikes but only during pregnancy. Once the child is born the diabetes goes away. The measurable amount of glucose in the blood stream. A delicate balance, almost like being on a bike. The hormone produced by the pancreas. Insulin is necessary for glucose to enter cells of the body to be used for energy. People with diabetes inject this because their pancreas got fired like a mail man that forgot to deliver Christmas presents. A dose of rapid acting insulin. This is given to correct a high blood sugar or given at meals. 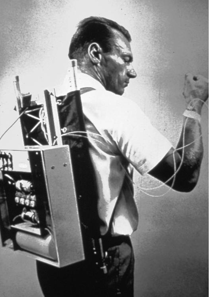 Delivered in the form of an injection or through an insulin pump. A dose of long acting insulin, while making this with my diabetic friend Tom he says I can't say "long acting" because if given through a pump the insulin might not be "long acting" insulin, okay so Tom says "insulin required to perform normal metabolic function". This keeps your blood sugar stable between meals. Best way to think about it, it's "background" insulin. A "normal" (nondiabetic) person may run between 80-120 but no one "really" knows what they run. Most people I have met try to keep it between 80-120 during the day but during exercise most people try to keep it a little higher than that to be safe from a low blood sugar. Happens when the body does not have insulin or when the diabetic makes a "not so fun" mistake with the delicate balance of blood sugar. When the blood sugar is high symptoms include thirst, frequent urination and fatigue. Just the opposite of high blood sugar. When the blood sugar goes below 80. The handheld device that tests blood sugar. Using a small drop of blood on a "test strip" in the device ones blood sugar magically appears like a lab result. This one could go on forever but think of it this way. A nondiabetic has a working pancreas, much like driving an automatic car. 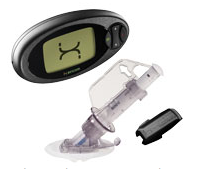 A person with diabetes uses an insulin pump instead of the pancreas, much like a manual car. This is an alternative to multiple daily injections. The two main features are the balas rate to keep blood sugar stable and the bolus for meals and blood sugar corrections. 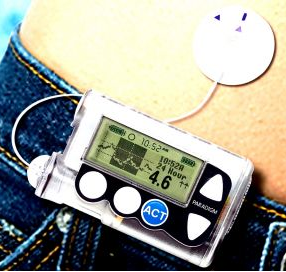 Measures blood sugar continuously. Well, it doesn't measure blood sugar "on time", it's more of a lag because the meter is actually measuring the interstitial fluid (the fluid between cells of the body). But hey, it gives the diabetic a good idea of what's really going on. The evil chemical substances that "are made by the body when fat is used as a fuel source instead of glucose". Think of it as being sick, it's awful… awful. This is the result of high blood sugar or complete lack of insulin. Sick feeling caused by too little insulin when the body begins to breakdown muscle and fat for energy. Ketones are released into the urine and blood. Yuck. Three month average of blood sugar. A fun little blood test at the doctor. Synthetic version of the body's natural hormone, Amylin. Works in conjunction with insulin to control post meal blood sugar spikes. Aka, it makes a diabetic feel full, which we never normally do. Hormone that is injected into a person with diabetes to raise blood sugar level when it's VERY low. This hormone occurs naturally in non-diabetics. Basically only if the diabetic is so low they can't eat or treat the low themselves. Cells found in the pancreas that make insulin. A 501(c)3 nonprofit organization that inspires people with diabetes to set personal fitness goals, educates them on adaptive management strategies through hands-on experience, and equips them to explore their individual capacities. "Diabetic Athlete's Handbook". Many of my friends are referenced in this book, it's a good resource for questions about diabetes.